Israeli police in Jerusalem arrested on Sunday a senior Muslim cleric attached to the sacred compound in the Old City, two days after he re-opened a mosque sealed by Israel during a Palestinian uprising in 2003. 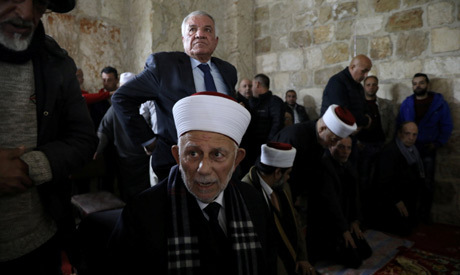 Sheikh Abdel-Azeem Salhab, who sits on the religious council appointed by Jordan to oversee the Islamic sites at the compound, personally reopened the gate leading into the Bab al-Rahmeh mosque on Friday, and hundreds of Muslims went inside to pray for the first time in years. It followed days of tension between Israeli police and the Muslim religious authorities over access to a corner of the 35-acre sacred compound known to Jews as Temple Mount and to Muslims as The Noble Sanctuary. In the build up to Friday prayers police arrested 60 people they suspected would incite violence, and boosted the security presence in the Old City. But the day passed without serious incident. Police spokesman Micky Rosenfeld told Reuters Salhab and another person were arrested on Sunday morning, two days after the incident, for breaching an order, and that they were being held for questioning. Salhab's lawyer said that Israeli police had banned him from accessing the compound for seven days, but there was no immediate comment from the police on whether they had issued such an order. The small Bab al-Rahmeh mosque that Salhab opened lies on the eastern side of the compound, which is revered by Jews as the site of the Jewish temples of antiquity. Muslims call it al-Haram al-Sharif, or The Noble Sanctuary, and regard it as the third holiest site in Islam. Its present-day skyline is dominated by two Muslim shrines, the Dome of the Rock and the Al-Aqsa Mosque. Saeb Erekat, a senior aide to President Mahmoud Abbas, denounced the arrests "in the strongest terms" and demanded their immediate release. Jordan's minister in charge of the Waqf and Islamic affairs, Abdul Nasser Moussa Abu al-Basal, called it "an unacceptable and dangerous escalation that impacts Jordan's role as a caretaker of Jerusalem's holy sites." Because of the religious sensitivities over the site the king of Jordan retains a role in ensuring the upkeep of the Muslim holy places in the city and Jordan appoints the Waqf Council which oversees compound. Israel captured East Jerusalem from Jordan in the 1967 Middle East war and annexed it in a move not recognised internationally. The United Nations regards East Jerusalem as occupied, and the city's status as disputed until resolved by negotiations between Israel and the Palestinians.